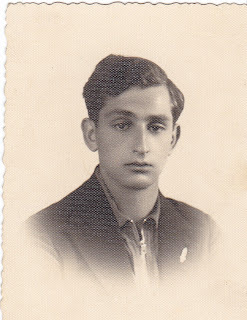 A picture of Shlomo Joffe -- a maternal cousin of my grandmother Riva-Rachel (Orelowitz) Rachowitz. Shlomo had bestowed this picture upon the Rachowitz family in February 1936, before he emigrated to Eretz Israel (on March 18, 1936). In 1939 he joined kibbutz Ramat Yohanan (please visit my Memorial Page for more details).